Description: This is an interface cable for the Bus Pirate, designed to connect to its 2x5 I/O header. 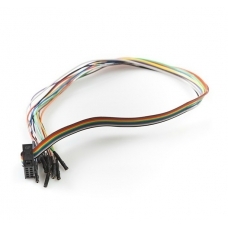 The cable's connector is composed of two rows of five 0.1" spaced pins; it's also polarized, as is the mating connector on-board the Bus Pirate, so you can only connect the cable in one direction. The leads of the cable are terminated with female ends to mate with test hooks (coming soon! ).